In today’s connected world, consumers use many smart products and numerous one-off apps to control their experiences. Observables seeks to untangle the web of things by delivering a single unified platform through the most needed device in any home or business: the router. The IOBOT Intelligent Signal Router with the AlwaysON platform software deliver customized solutions that allow both the dealer and their customers to uniquely connect, manage, monitor and control critical new and legacy infrastructure, including alarm systems, computer networks, access control, smart home, phones, and video surveillance, in a singular back-end dashboard and front-end mobile app. Observables Inc. was founded in 2014 by security and AV integrator vets Abe Schryer and Ron Gans. After years troubleshooting AV and security systems in their custom installation business, the pair recognized there was a growing need for a security, smart home and IT solution that would simplify installation and mitigate technical support by unifying the growing list of disparate IoT devices into an all-in-one cross platform system. Unlike any other solution on the market, patent-pending IOBOT with AlwaysON will revolutionize the security, AV, smart home and IT dealers’ business model. IOBOT is the industry’s first intelligent router with modular design for dealers to order with custom configurations for customers across vertical markets. IOBOT with AlwaysON provides dealers with simplified integration, backend diagnostics with self-healing, reduced truck rolls, minimized inventory, and new RMR opportunities along with back-office capabilities for managing their business. 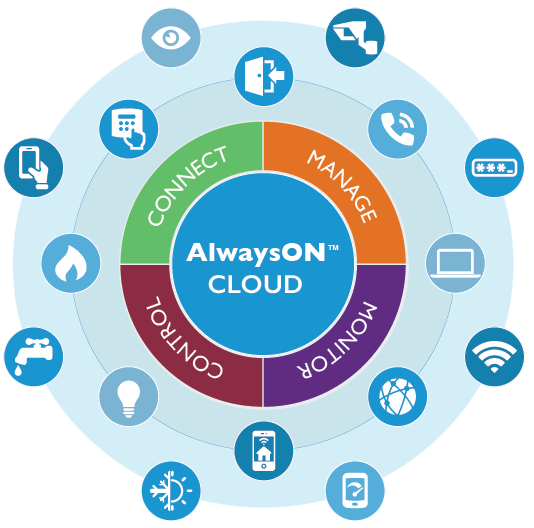 AlwaysON simultaneously offers end users a streamlined, easy-to-use mobile app for improved awareness about their home or business, increased safety and security alerts, and optional satellite back up for persistent monitoring for new or legacy security systems. Observables brings on-the-ground innovation to the industry, including the ability to add satellite to any alarm panel, unify disparate systems that previously were unable to be managed in a single UI, and the ability to make existing systems smart with single app integration. Observables is privately held in Santa Barbara, California. To learn more, follow Observables on Facebook and Twitter. AlwaysON, Connecting you to what is important…Observables.